Easy homemade soft pretzel knots, seasoned with everything seasoning! 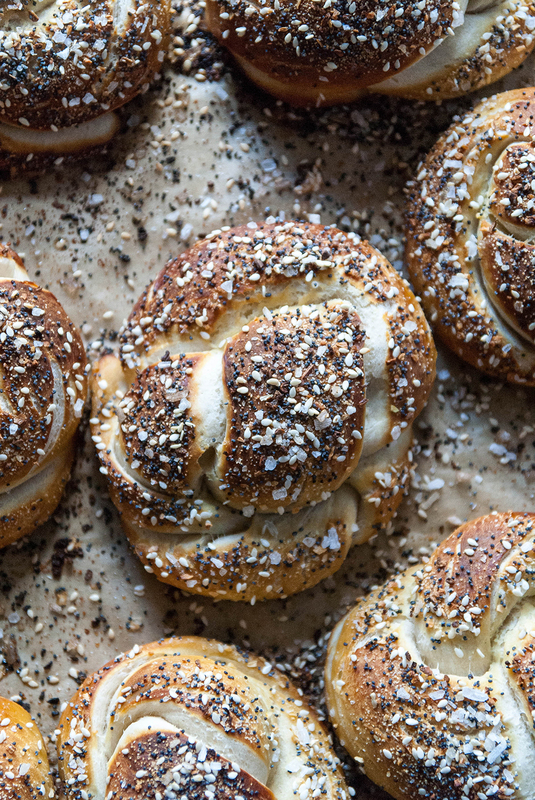 Like a homemade everything bagel, but in pretzel form! Combine 1½ cups warm water, the sugar and kosher salt in the bowl of a stand mixer and sprinkle the yeast on top. Set aside for 5 minutes, or until the mixture foams. Add the flour and olive oil and mix on low speed with the dough hook attachment until well combined. Change to medium speed and knead until the dough is smooth and pulls away from the side of the bowl, 4 to 5 minutes. Remove the dough from the bowl and oil it lightly with olive oil. Return the dough to the bowl, cover with plastic wrap, and set aside in a warm place for 50 to 55 minutes, or until the dough has doubled in size. Heat the oven to 450°F. Line 2 half sheet pans with parchment paper and lightly brush with oil. Set aside. In a small bowl, combine the spices for the everything spice blend and stir until combined. Set aside. Bring the 10 cups water and the baking soda to a boil in a large Dutch oven. Turn the dough out onto a lightly oiled work surface (such as a large pastry board brushed with melted coconut oil) and divide into 8 equal pieces. Roll out each piece of dough into a 24-inch rope. Make into a knot and repeat with remaining dough. One by one, place the pretzels in the boiling water for 30 seconds. Remove them from the water using a large flat spatula. Return them to the sheet pans, brush the top of each pretzel with the melted coconut oil and sprinkle with the spice mixture. Bake until dark golden brown in color, 14-16 minutes. Transfer to a cooling rack for at least 5 minutes before serving. Best served within the first day of baking. Recipe created by Heart of a Baker.